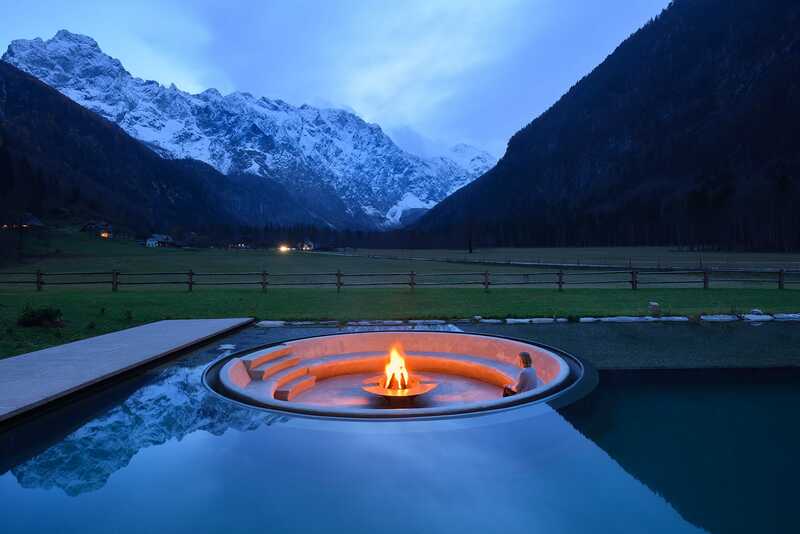 ENOTA: Hotel Plesnik is a boutique family hotel found in the heart of a nature park, boasting a tradition spanning over eighty years. 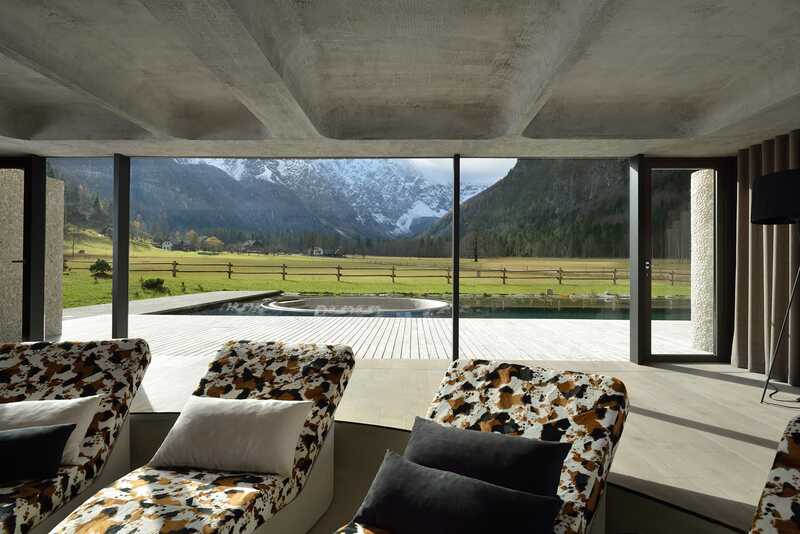 Its exceptional location at the end of a glacial valley offers an unforgettable view of the majestic peaks of the Kamnik-Savinja Alps. 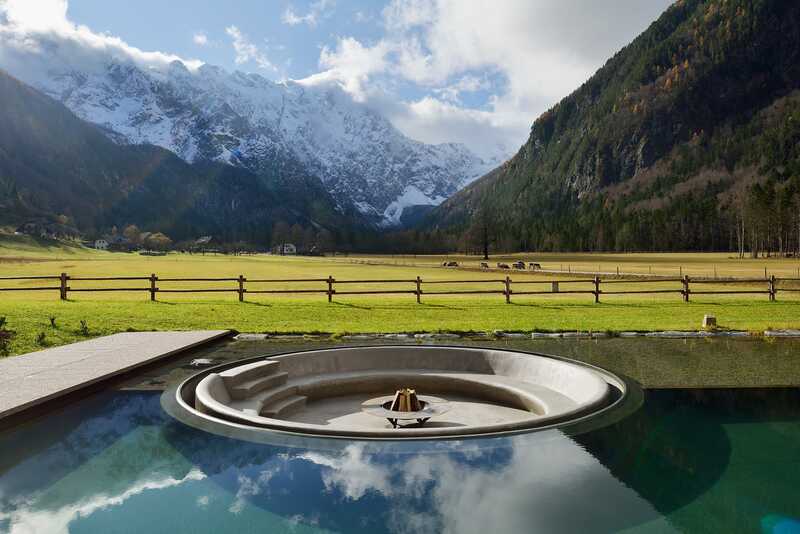 As Logarska Valley is claimed by many to be one of the most beautiful valleys in Europe, the amazing view of this natural wonder was the obvious choice for one of the leading motifs in the renovation of the hotel’s wellness centre. 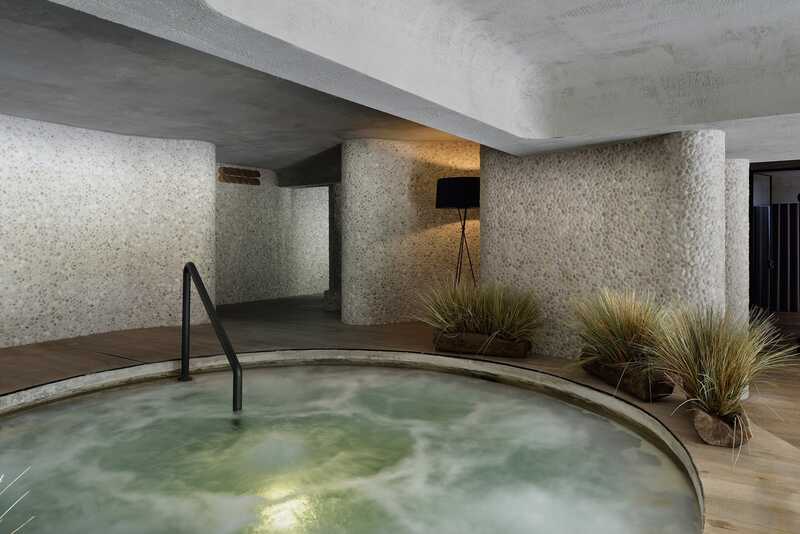 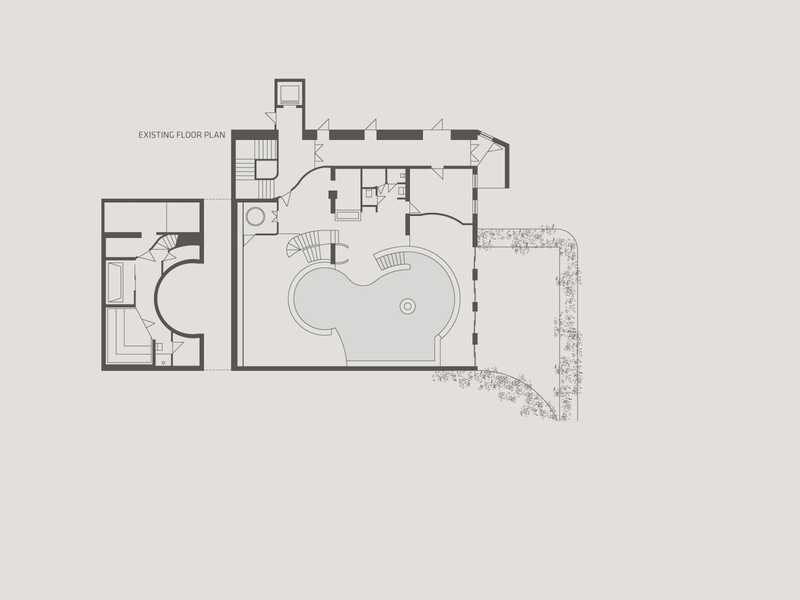 Much of the space of the pre-existing wellness centre in the partially cut-in basement of the building was originally taken up by a small, organically shaped pool which opened onto a tanning deck directly in front of the building. 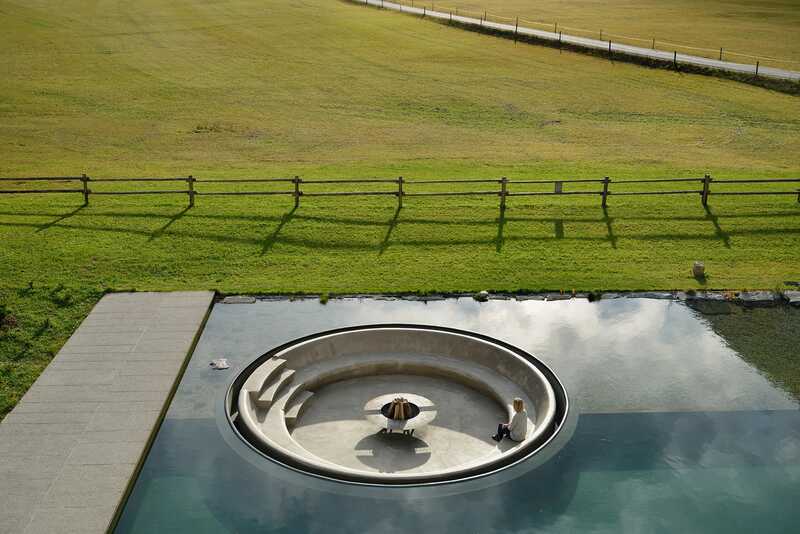 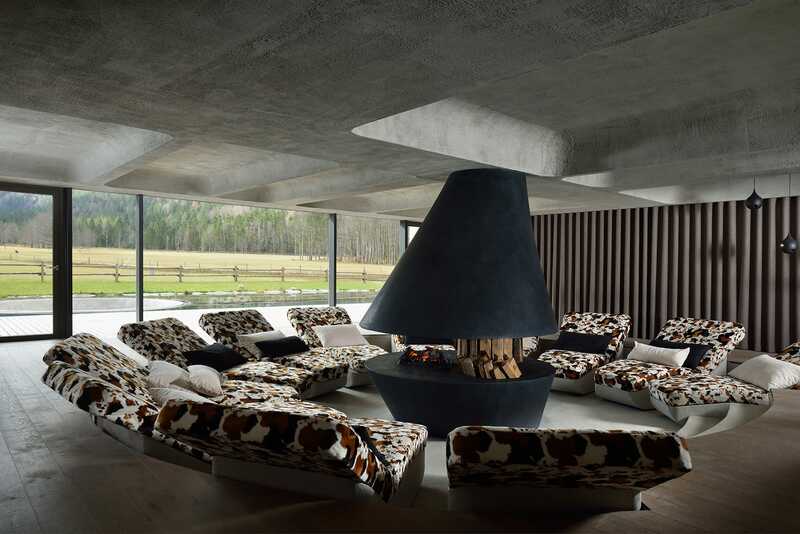 To recover the space needed for new programmes, the pool was in part replaced by a large whirlpool, while a section of the former pool shell closer to the view of the valley was repurposed as a sunken circular resting area featuring a fireplace. 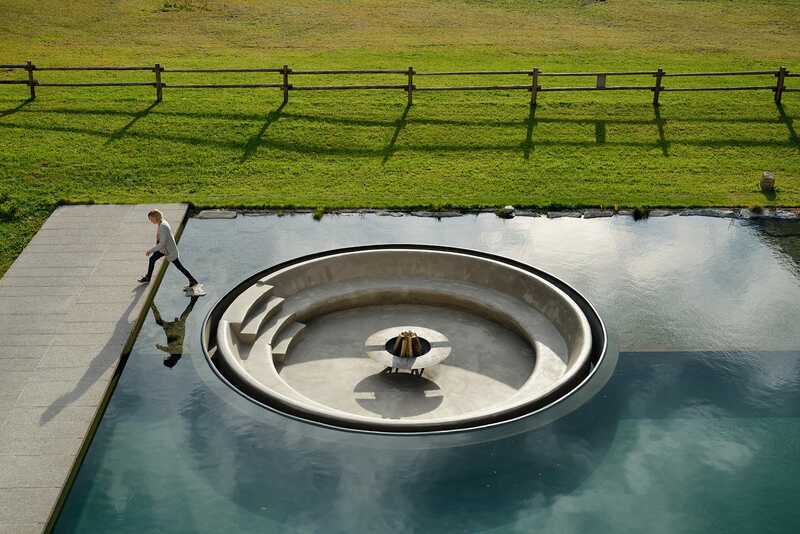 The sun deck has been extended with a natural swimming pool, which makes up for and expands on the deleted interior water surface, while the reflection in the water further accents the beautiful view. 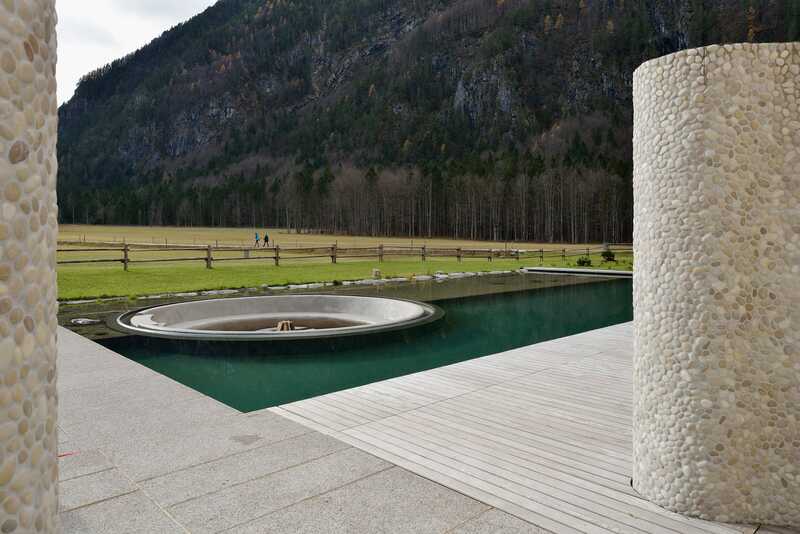 Despite natural filtration by means of aquatic plants, the new pool is unequivocally rectilinear in shape and as such designed to be a continuation of the building rather than the surrounding landscape. 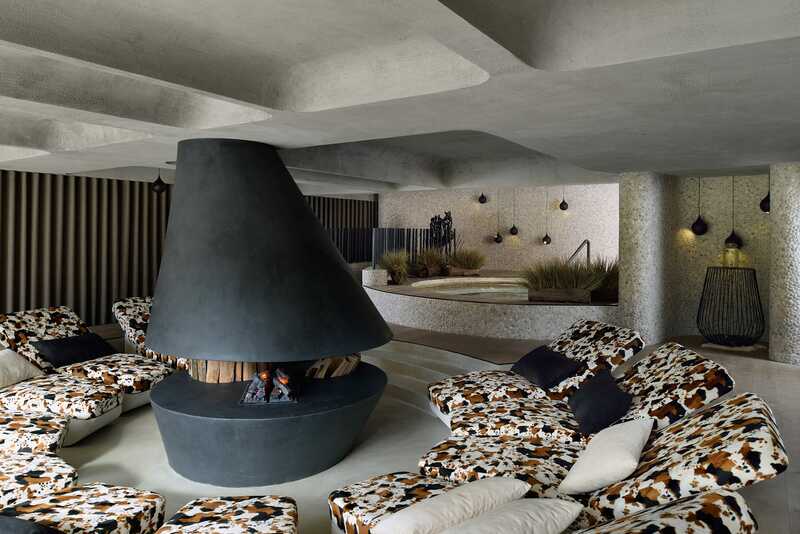 Referencing the interior resting area with the fireplace, a relaxation area with a fire ring has been placed in the middle of the water surface outside. 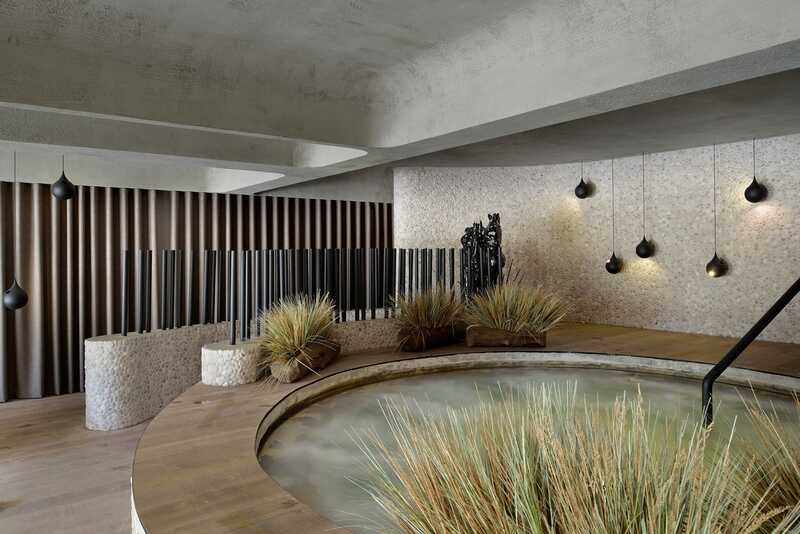 Using the space, the visitors of the new wellness centre witness a never-ending dialogue between water and fire, two basic natural elements accentuating the incredible backdrop of the surrounding hill range. 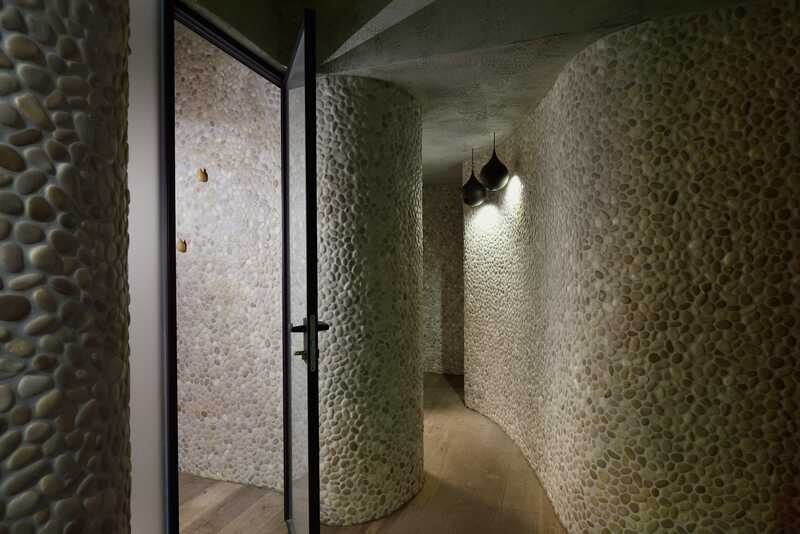 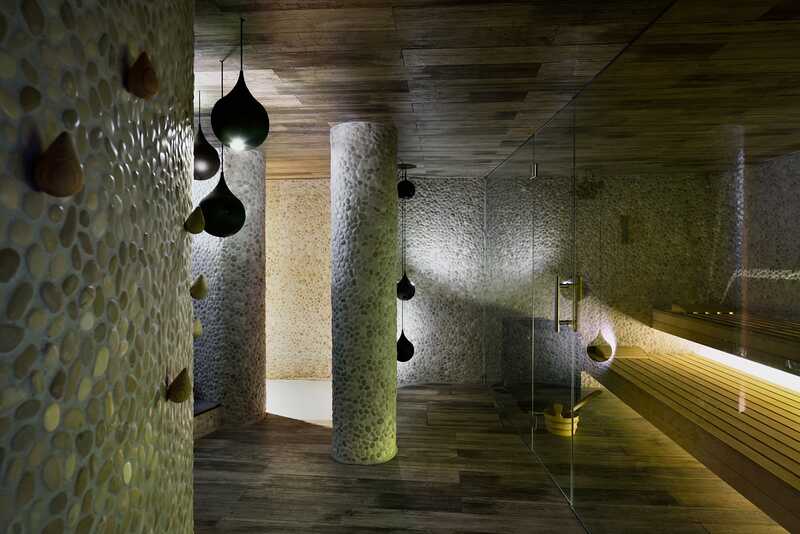 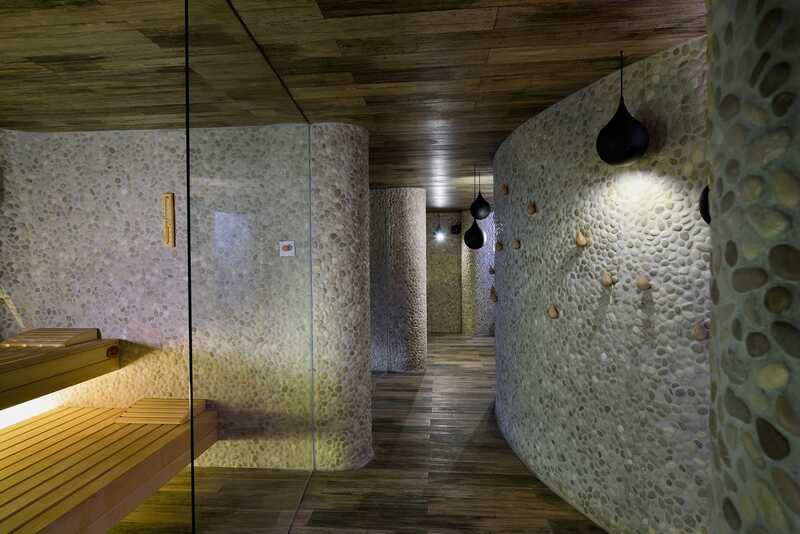 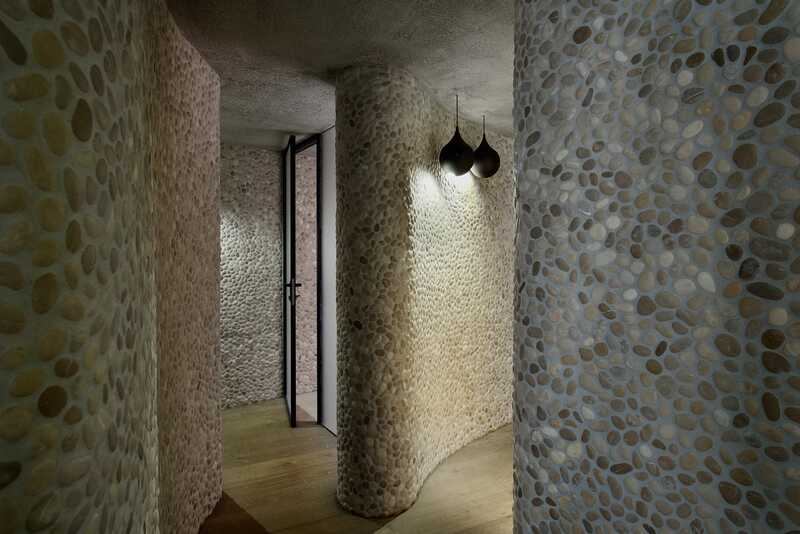 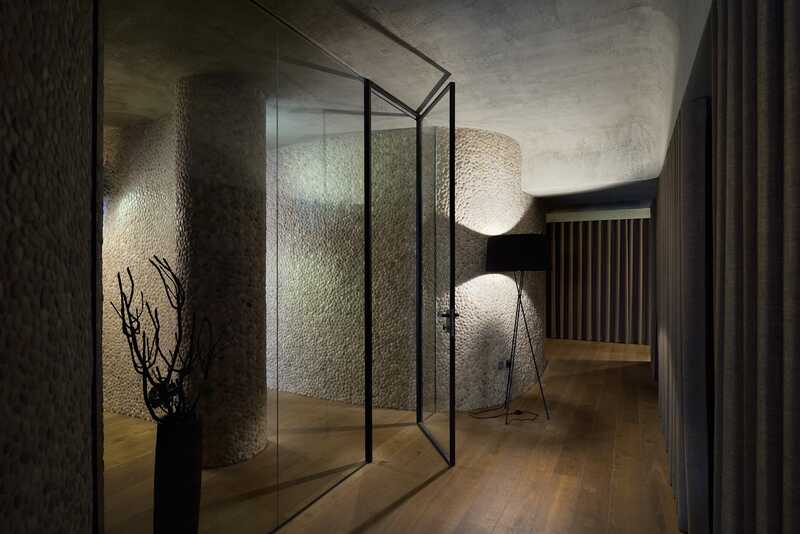 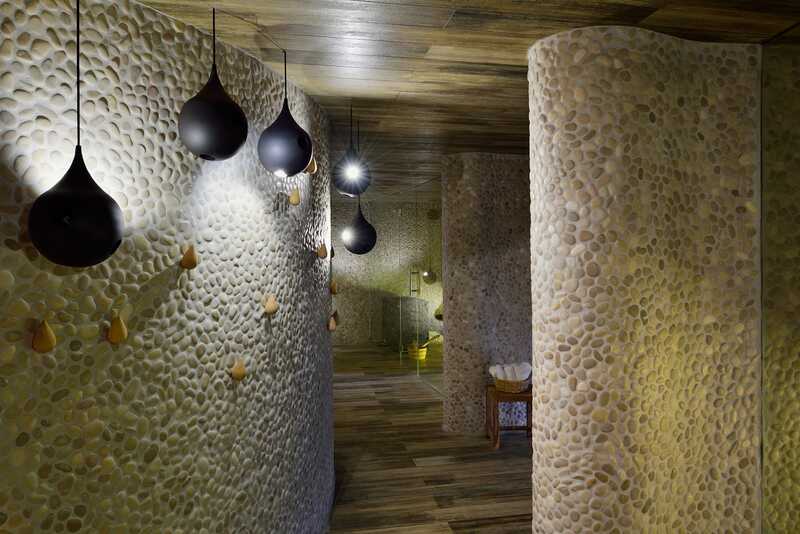 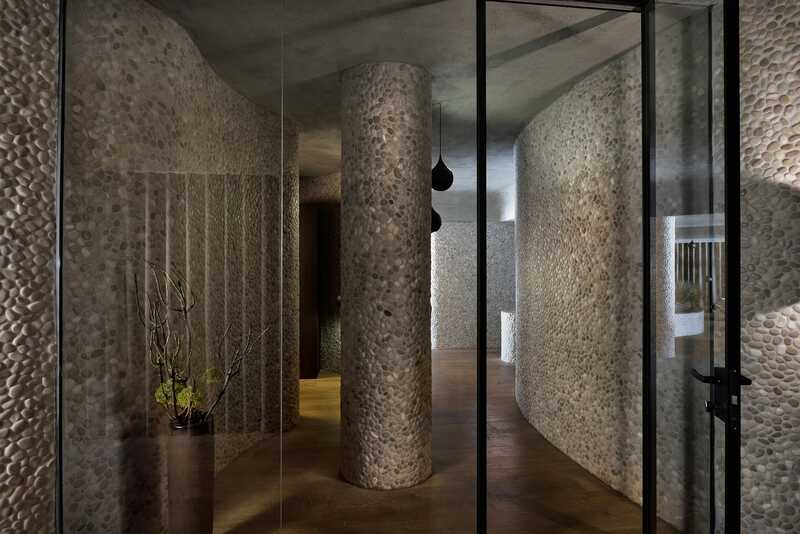 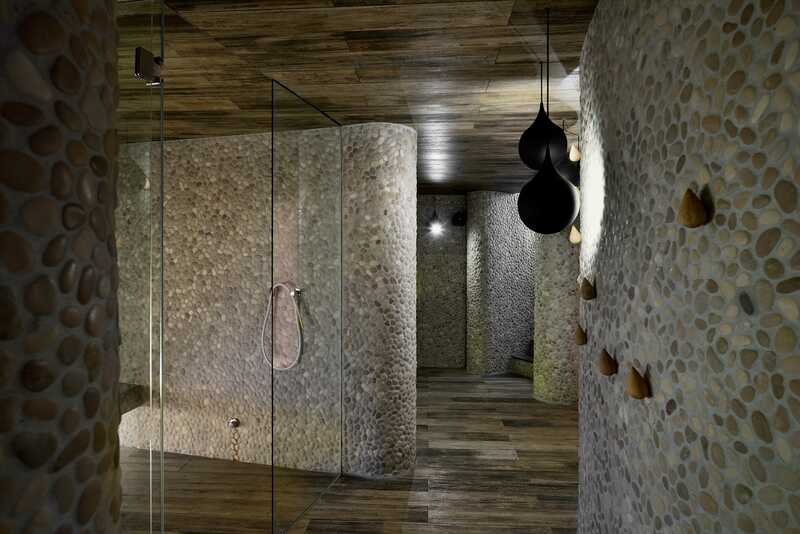 The entire ambient of Wellness Plesnik is designed using local materials exclusively. 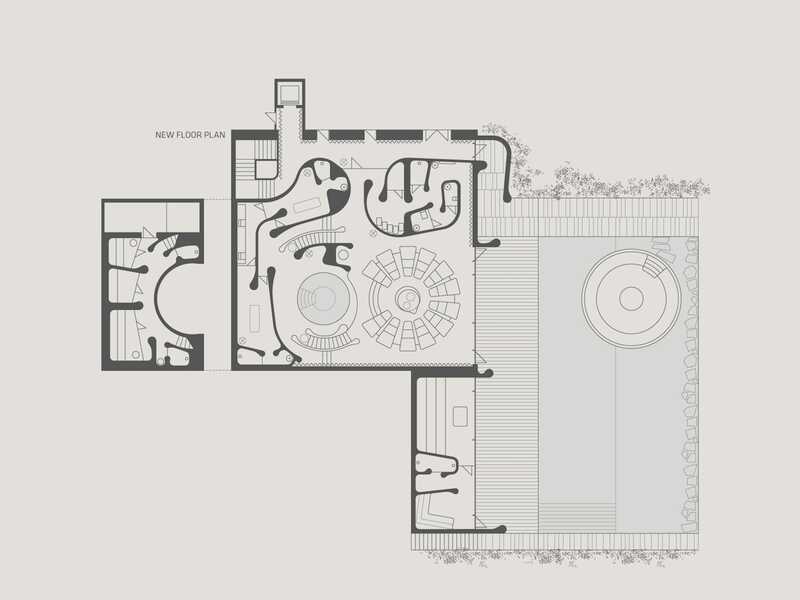 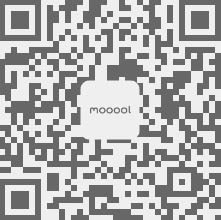 The undulating interior walls were necessitated by the markedly awkward and heterogenous construction design of the existing space. 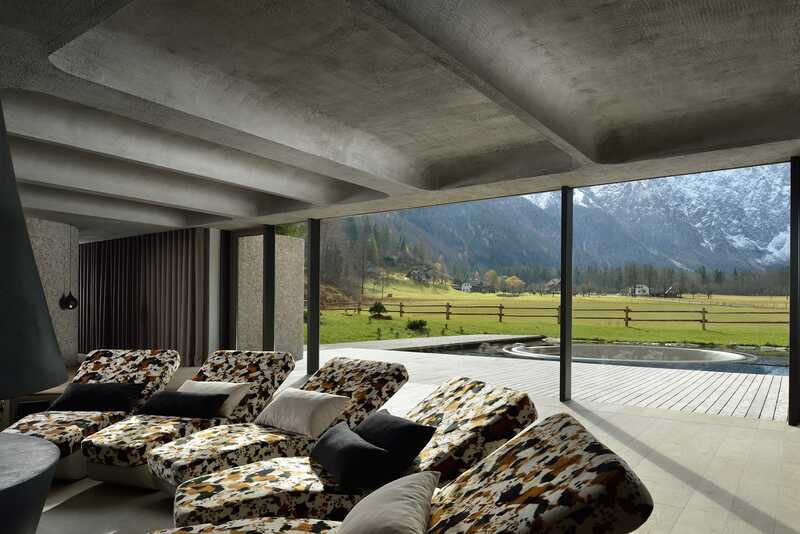 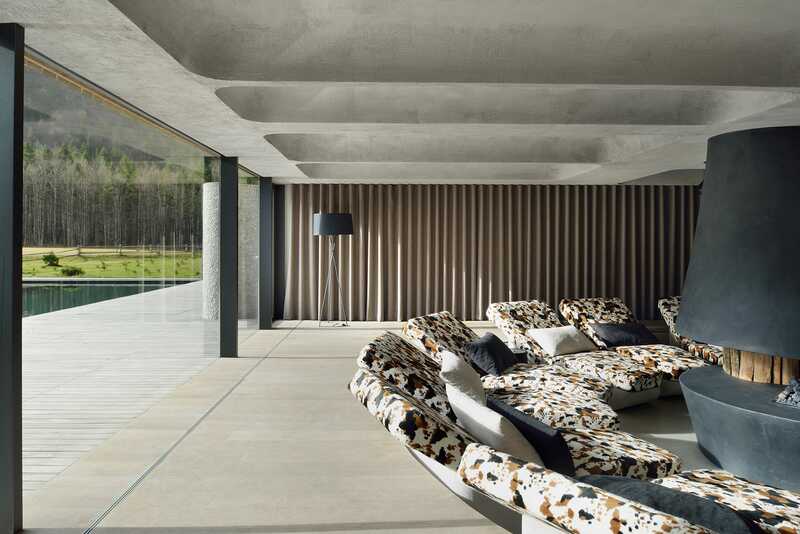 A relaxed placement of interior divides envelops and conceals all the irregularities and forms a fluid space terminating in the valley itself. 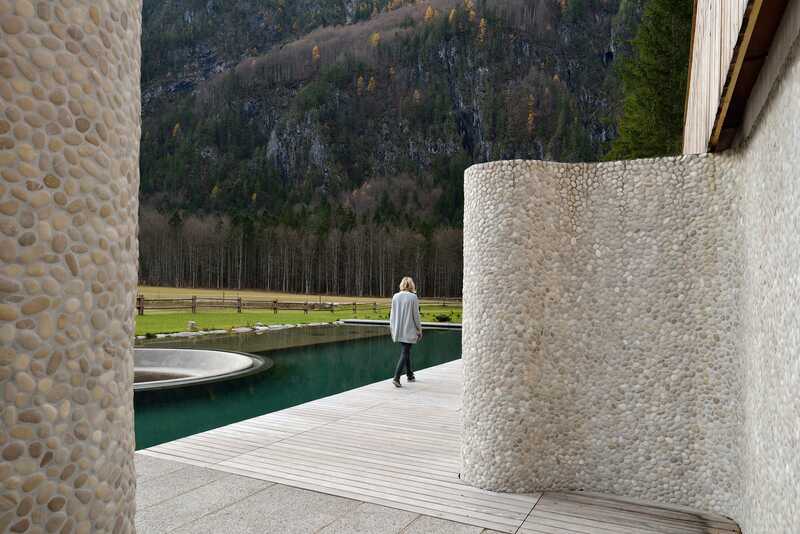 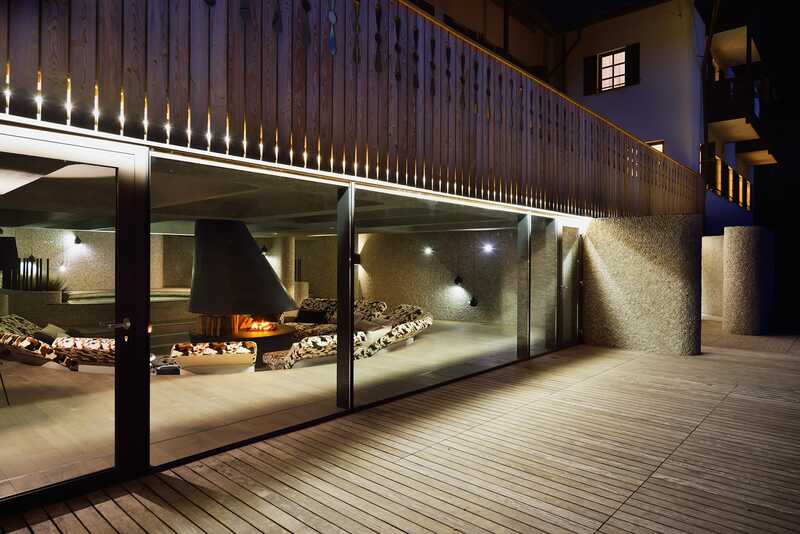 The pebble-laid walls of the space physically transition also into the exterior and optically divide the sun deck into three parts: the sauna section, the section with the central wellness space, and the entrance portal. 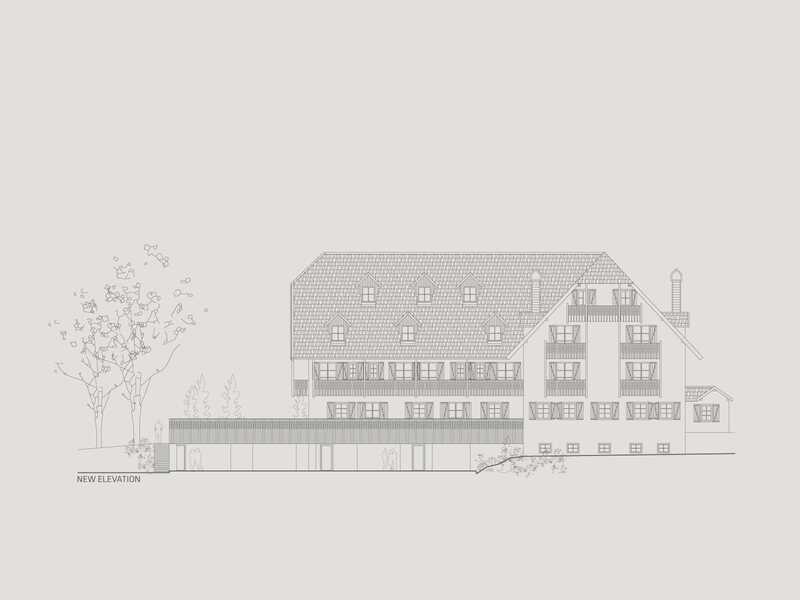 The facade between the divisions is fully encased in glass and replaces the former arch-head windows. 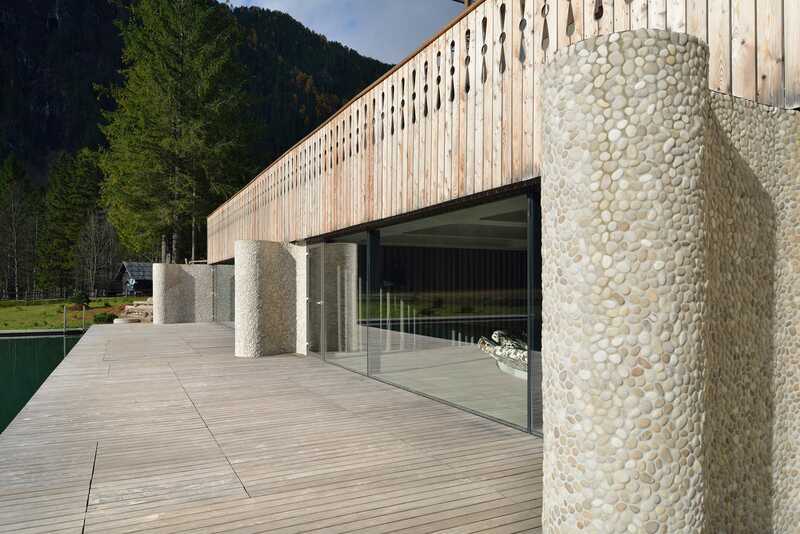 The enlargement of the facade openings further connects the interior space of the wellness centre with the picturesque exterior and reduces its presence in the space despite the actual expansion of the basic volume. 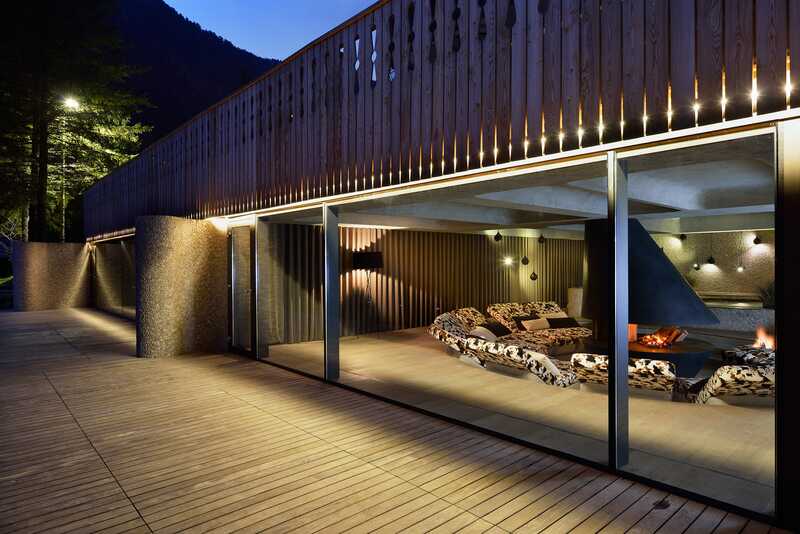 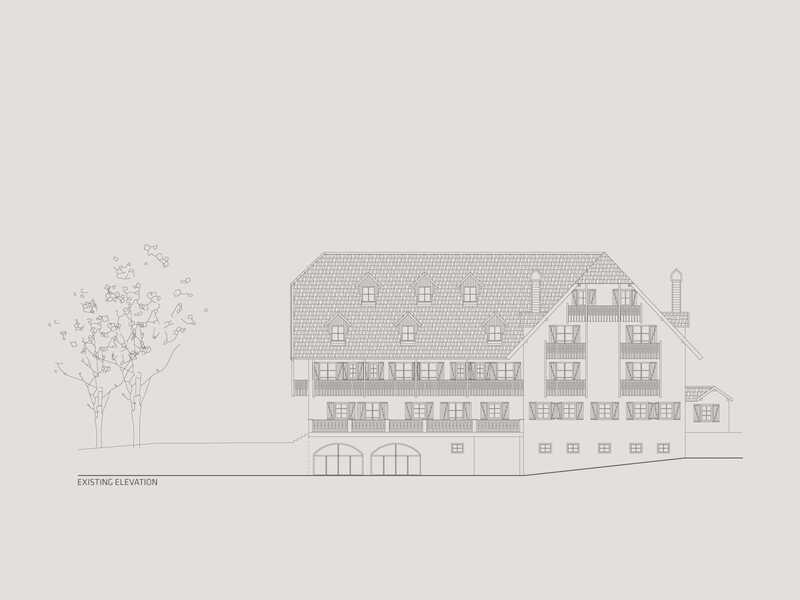 With the extension having been purified of all distinct architectural elements, it now belongs with the surrounding terrain rather than with the master building.